When Mark and Nancy Sheppard began missionary service in Liberia, Nancy had no idea what God would ask of her. Their idyllic first term was followed by the Liberian Civil War and a nightmarish year working among Liberian refugees in the Ivory Coast. Conditions were difficult, expectations overwhelming and the tensions of the war at their doorstep. Fear, self-pity, resentment and depression haunted her. God used Nancy's difficult decision to follow her husband's leadership and remain in refugee work to begin an amazing spiritual journey—one that led to a clearer understanding of biblical womanhood as well as a deeper relationship with the Lord and with her husband. The book chronicles Nancy's journey to true peace in the midst of very difficult circumstances. As God teaches her about genuine service, submission, sincere prayer, reverence and humility, she is totally and completely transformed. The scenarios are unique to Nancy, but every seeking Christian can fully identify with the spiritual lessons. A unique reading experience, this interactive eBook contains many full color pictures as well as links to pertinent YouTube videos. 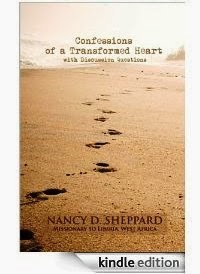 This Kindle edition of "Confessions of a Transformed Heart" will not disappoint!